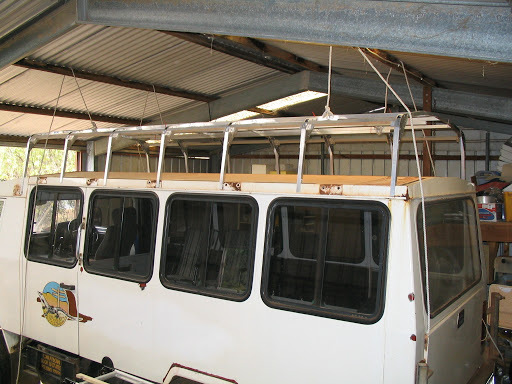 We constructed a raised roof for the Oka, as an alternative to a poptop, which will give us sufficient head room to walk about and additional storage which is not available in a pop-top design. 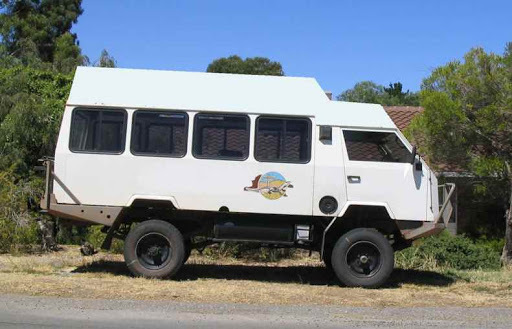 Overall height was a concern on bush tracks, but the design height is no more than a bus model fitted with a roof rack and loaded with equipment. 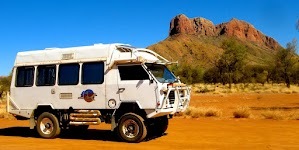 The roof is built from a 25 mm square aluminium tube frame covered with aluminium sheeting. 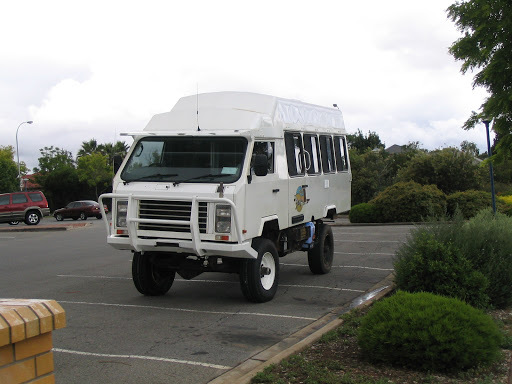 The over-cab section is more of an enclosed roof-rack for storage of lightweight, infrequently used items such as ropes, fanbelts, hoses, awning sides and walls, cold weather gear etc. 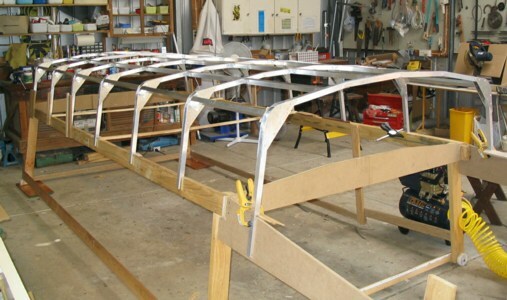 The main roof frame was built on a wooden space frame with the exact dimensions of the Oka roof line, which is easier than working 2 1/2m up in the air. The frame is substantially complete. Now for a test fitting. Looks pretty symmetrical too. 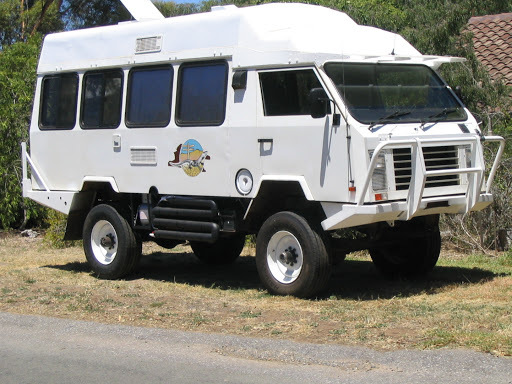 The frame is surprisingly strong, but the leading edges and rear panels will be reinforced the to withstand the inevitable attack by tree branches. 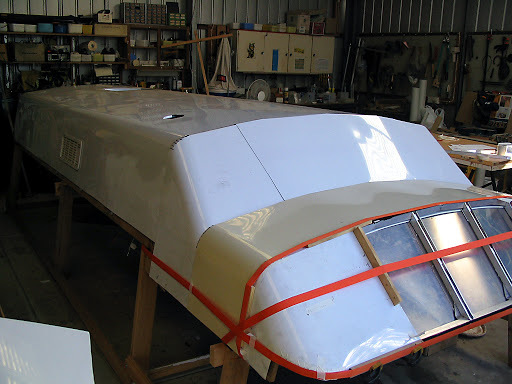 With the nose cone assembled it was time for a final fitting of the frame before the lining and skin were fitted. The shape is partly for asthetics and partly as an attempt at improving aerodynamics. The roof was lined with 5mm CoreFlute, a sort of corrugated plastic sheeting normally used for sign boards, with edges fixed using plastic wall framing mouldings and double sided sticky tape to hold it in place during construction. 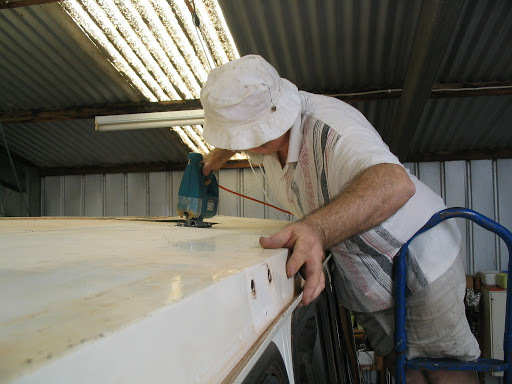 When complete the roof lining sheets are held in place between the plastic mouldings and the original Oka roof. The CoreFlute was covered with FrontRunner headlining material (also called WonderWall, from Spotlight), stuck on with spray adhesive. 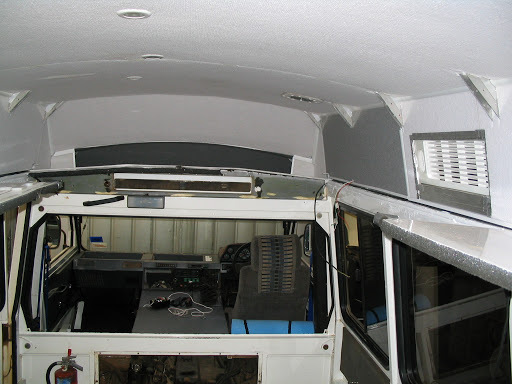 Lighting, fans and vents were built in to the frame and wired up before the lining was installed. 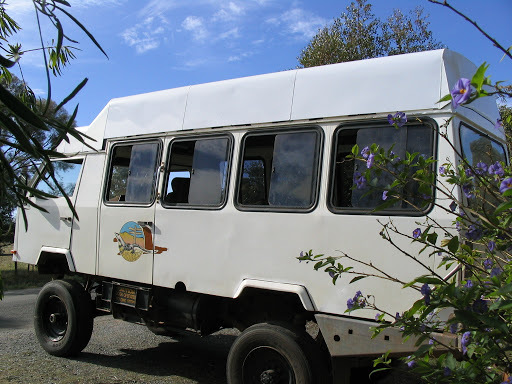 The exhaust grille for the fridge was also built into the side of the roof. 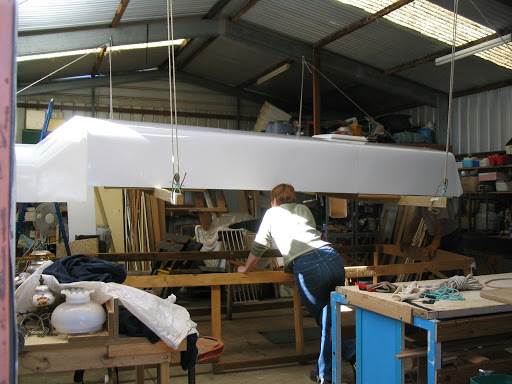 The frame was insulated with 25 mm GreenStuf polyester fibre to avoid the dangers of fibreglass or polystyrene. 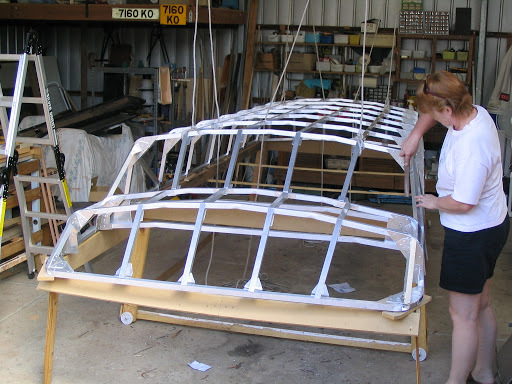 The outer aluminium skin was attached to the frame with Sikaflex 252 using all the recommended cleaning and priming instructions. 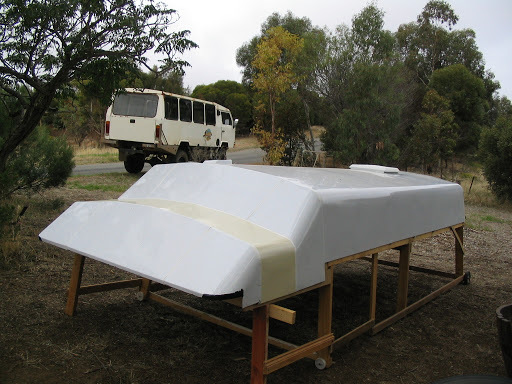 The sheets overlap by 25mm from the rear to avoid leaks and were strapped on for 24 hours for the adhesive to cure. 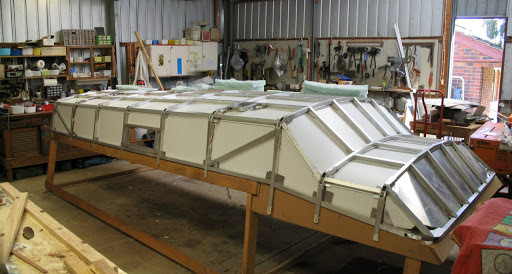 The edge curves for the top sheets were made by bending them over a length of 150 mm PVC pipe clamped to the edge of a work bench before fitting. The curved front side sections were first made using templates of brown paper to get the shape and size right before cutting the aluminium. It's surprising how different curved, angled sheets look when laid out flat. 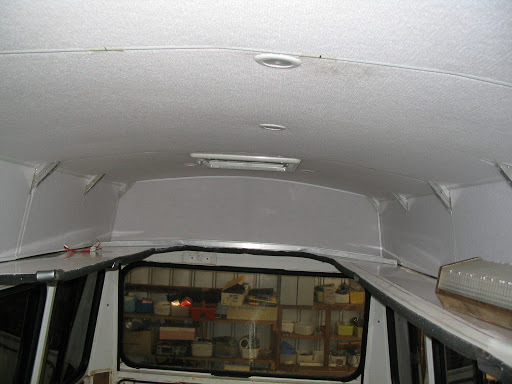 The seams were sealed using Sikabond Pro and touched up with white paint. 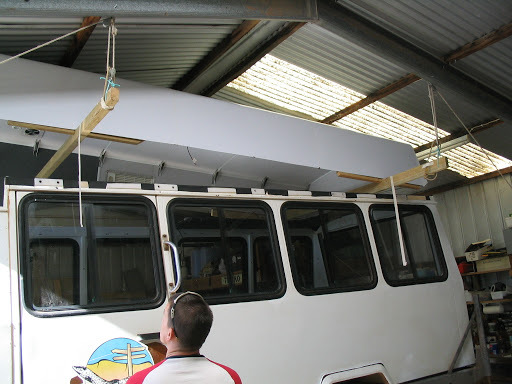 Completed roof assembly on its wooden spaceframe model, parked outside while the Oka was prepared to receive it. Cutting out the existing Oka roof proved to be quite easy with a jigsaw. However, I was surprised how heavy the removed sheet of roofing steel was. The cut out is in from the edges by about 400mm so we can use the remaining roof area as the bottom of overhead cupboards. Fitting the Roof. The was an exciting day when all the planning and construction work came together. After a couple of minor hiccups, the roof fitted on with no major dramas. 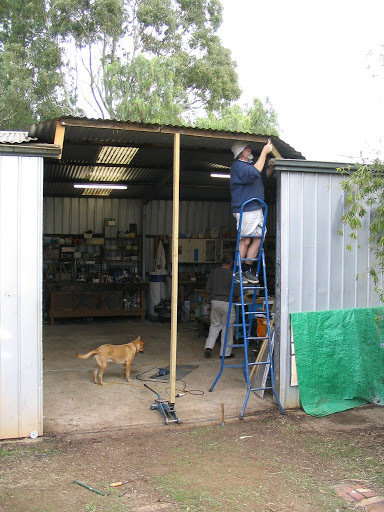 I made a frame to suspend the roof from the shed beams as it was lowered on to the Oka. 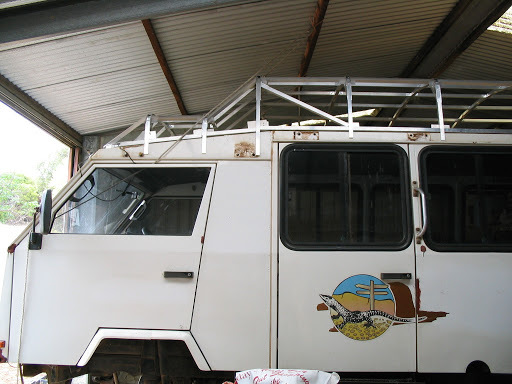 The roof is attached to the Oka using aluminium strips Sikaflexed to the roof and bolted to the Oka using the existing roof rack bolts. 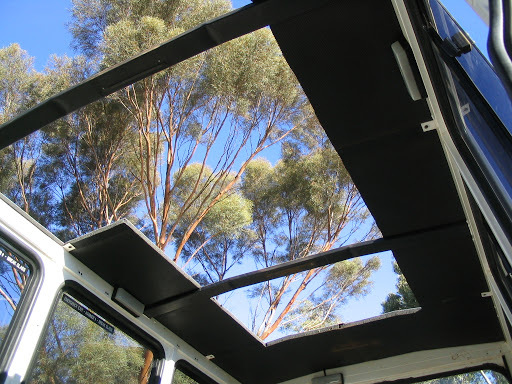 This maintains the sealed structure of the roof down the sides of the Oka to minimise leakage or dust ingress. A bead of polystyrene rope was inserted all round the lower edge of the roof to keep out draughts and insects. Final fitting of the roof presented a challenge as the shed door is not tall enough to get the Oka out with the new roof on. We needed another 300mm and some lateral thought was required. In the end we cut out the front of the shed roof and jacked it up so it looks a bit like a chinese temple. But we should now be able to drive in and out with about 200mm to spare. External Views of Fitted roof. This is the roof after it's first fitting. It looks very similar to the planned design shown in the initial photos. Internal Views of Roof. The inside of the roof looks quite swish and has plenty of headroom for us (1.85m). There will be plenty of storage space around the inside of the new roof. 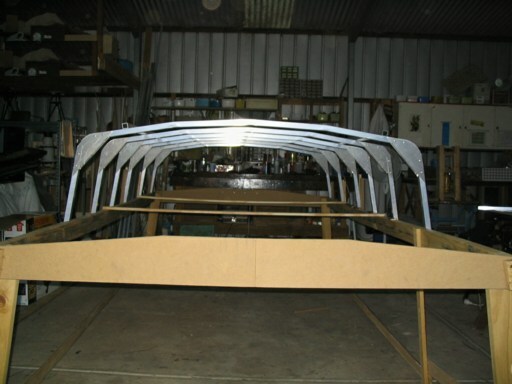 The completed roof on its first outing, showing the side plates which hold it down. The internal fit out will be described in subsequent articles.